At Opticare Vision Center we are confident that we can provide the eye care you need. Below you'll find a list of some of the key eye care services that our optometric practices in Greater Cincinnati offer. Comprehensive eye exams for adults and children, co-management of laser vision correction surgery, caring for eye emergencies and so much more. The optometrists in Opticare Vision Centers provide comprehensive eye care to patients of all ages including treatment for a range of conditions including glaucoma, diabetic retinopathy, dry eye, cataracts and macular degeneration. 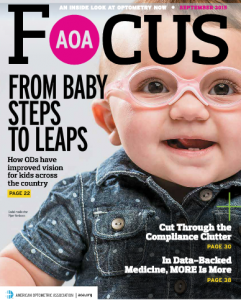 When visual or ocular problems are left undetected or untreated, a child’s personal well-being, learning capability and cognitive development will all be adversely affected. You or your child may be a candidate for the Binocular Vision Clinic for Vision Therapy. There’s a lot of talk nowadays about myopia and “myopia control” as a part of kids’ eye care. Defined simply, myopia refers to nearsightedness – which means that when your child looks at objects in the distance, they appear blurry. Orthokeratology, "ortho-k", or Paragon CRT, is the form of vision correction achieved by reshaping the eye with special rigid contact lenses. Our Cincinnati and Northern Kentucky eye doctors are certified to fit CRT lenses to treat nearsightedness or myopia without daytime contacts, eye surgery, or glasses.